Our newest podcast titled Rainscaping is focused on ways to manage excess water in your yard or neighborhood and thus, minimizing polluted runoff from reaching our waterways. 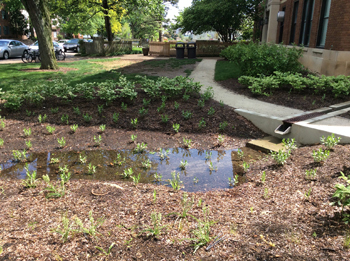 Putting water to work for us in a sustainable way is the focus on Purdue’s new Rainscaping program. Join us as our host Dr. Rod Williams learns from Kara Salazar about this new initiative. Kara is a Sustainable Communities Extension Specialist within the Department of Forestry and Natural Resources and is co-chair of the Purdue Rainscaping Education Program. Rainscaping, Got Nature? Podcast, MP3 file.